We know about taking the road less traveled. To me, doing things the hard way has the same allure. The hunt for the perfect estate sale light fixture, the set of vintage cabinets that are just right, the document wallpaper that pulls things all together. 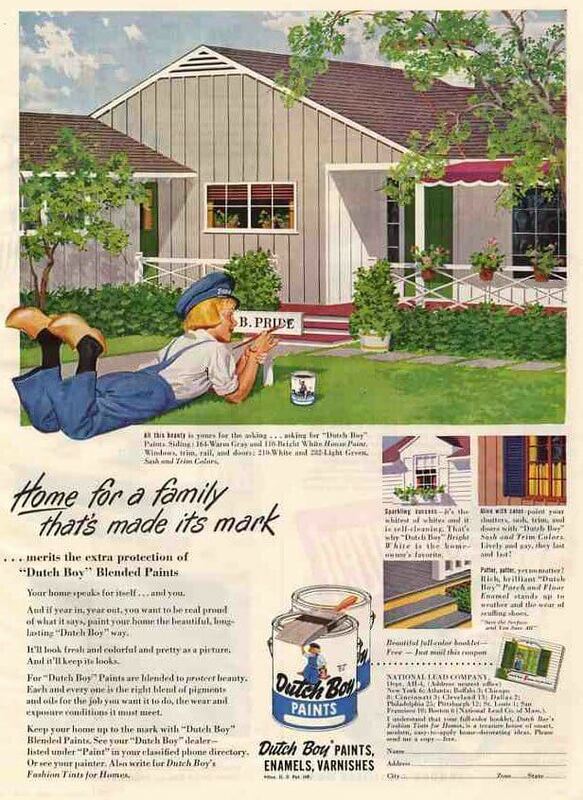 Honestly, the reason this blog even exists is that after completing big projects, I had so much info in my mental hard drive about the retro renovation alternatives available — all obsessively and endlessly researched — that it seemed a shame to simply be done with it when my projects were completed. But the dangers of the hard way came into focus this week, when I pulled Palm Springs Stephan into the vortex. A week ago Friday night I spotted the brand new, mint in box, never installed set of circa 1958 bathroom fixtures in this exact photo, on a forum. They’d just been posted. Hot! I happened to be emailing a bit with Stephan, and knew he was working on a bathroom reno. Long story short, he was very excited about the prospect of pink fixtures and spent hours back-and-forth with the seller in Cheyenne, Wyoming, trying to certify the exact color, before he sent a certified check. Hours with a tile store to coordinate tile. Planned to switch the plumbing. Worked out shipping. At one point thought it was a done deal. Ultimately, though, the color didn’t pan out for him, and it’s back to plan A. The moral of the story is — I guess — to know thyself. If you really truly want very special retro finds to complete your renovation vision, it’s gonna be a roller coaster. Requiring patience, tenacity, and a belief that once you put your vibes out there, the retro decorating gods will send you what you need. If you think that sounds fun — so then, will be doing it the hard way. P.S. Anyone within driving distance of Cheyenne, Wyoming, interested in a set of brand new, mint in box, never been installed Crane bathroom fixtures? 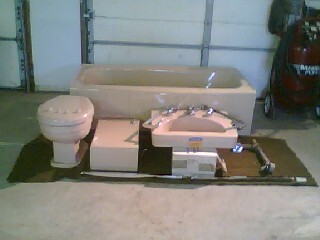 Tub, toilet with really cool seat, sink with chrome legs/towel bar, lav faucet, tub faucet. $1000. Email Gary, who seems very nice and appreciative of them, at: [item sold]. He can give you the whole story, which begins in North Dakota. Oh yeah. They’re not really pink. They’re beige. Or taupe. Or a sandy pinky beigey taupe. Something like that. Buckle up. This post was originally published Dec. 9, 2007, then again on Jan. 4, 2008. This is about doing things the hard way, isn’t it? I loved how the Craigslist poster that Shane referred to sold up the vintage toilet–“…actually flushes like they used to on one flush without plugging up as opposed to two or three..”! See, RR types, we are environmentally ‘Green’ and conscientious in oh-so-many ways! We SAVE things, but we also SAVE water! I don’t know what fool thought up the low-flush mandate, but they obviously never go the bathroom, and definitely could not have had children!! We live with two of the new-school commodes at the time present, and in the garage we have 1/each simple plunger, 1/each compound plunger (watch the shoes!) and 1/each toilet snake! Never in my life have I plunged so much except perhaps when I lived in the sticks with a malfunctioning septic system! Probably the same folks who advocate the lo-flow showerheads that make one stay in the shower over twice as long in order to get properly clean, huh? Gotta love those actuary tables, I guess. There was a great ‘King of the Hill’ episode that dealt with those toilets–anybody remember?